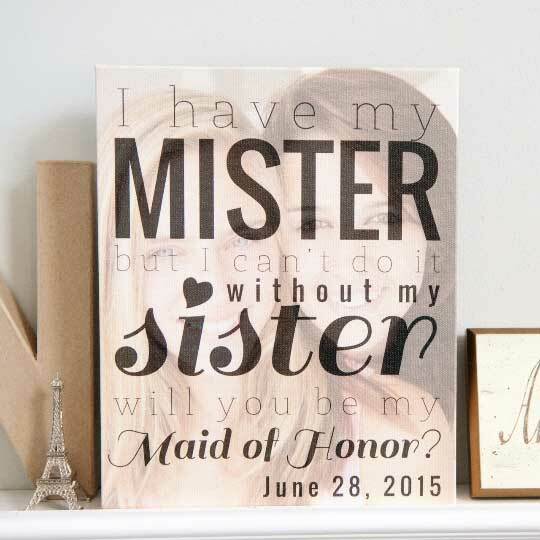 What better way to ask your close family member or friend to be your Maid or Matron of honor, or to be a Bridesmaid in your wedding than by providing them with a truly personalized and unique gift? Find your favorite photo and work with one of our dedicated Design Gurus to create a stylized and personalized Sister Maid of Honor or Bridesmaid gift that will touch your bridal party’s heart. These elegant gifts include photo quotes, photo frames, bridesmaid/maid of honor proposal signs, and more. Ask “Be My Maid of Honor” in style! Best of all, you’ll show your bridal party that they mean the world to you when you skip the normal big box store offerings and create truly customized gifts to convey your feelings. Order today and enjoy quick processing of your order and free shipping to anywhere in the US for order over $70!